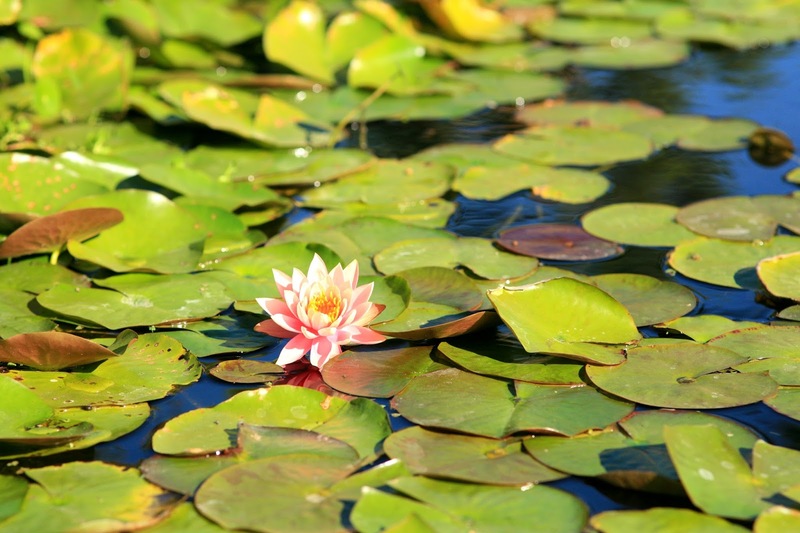 June 2015 – Grab a cuppa, tell a story or listen to one. 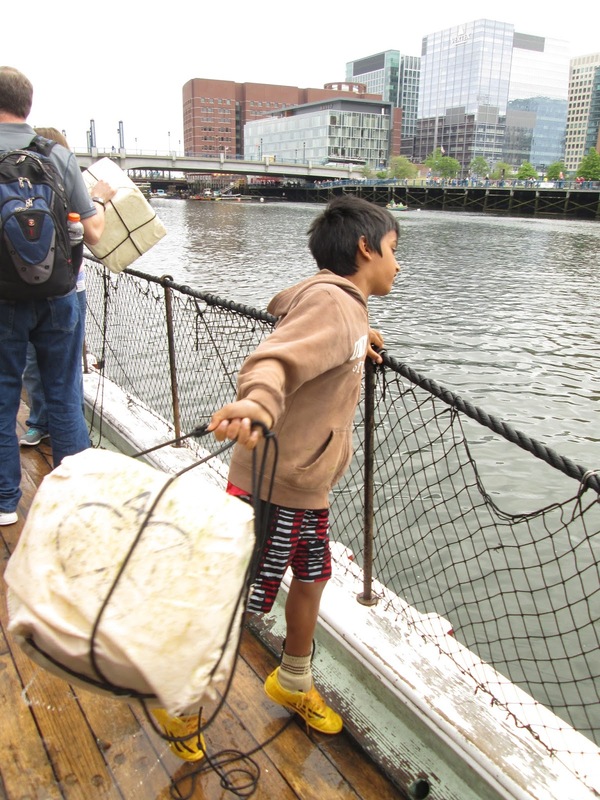 For our Travel Friday this week, Shish Kabob, one of our young author takes us on a trip to Boston Tea Party and Museum in Boston, Massachusetts, USA and there is re-enactment too. 340 chests of British East India Company Tea onboard three ships were smashed open with axes and dumped into Boston Harbor on the night of December 16,1773.The damage caused could have brewed an estimated 18,523,000 cups of tea and was worth $1.7 million US dollars (in today’s money). 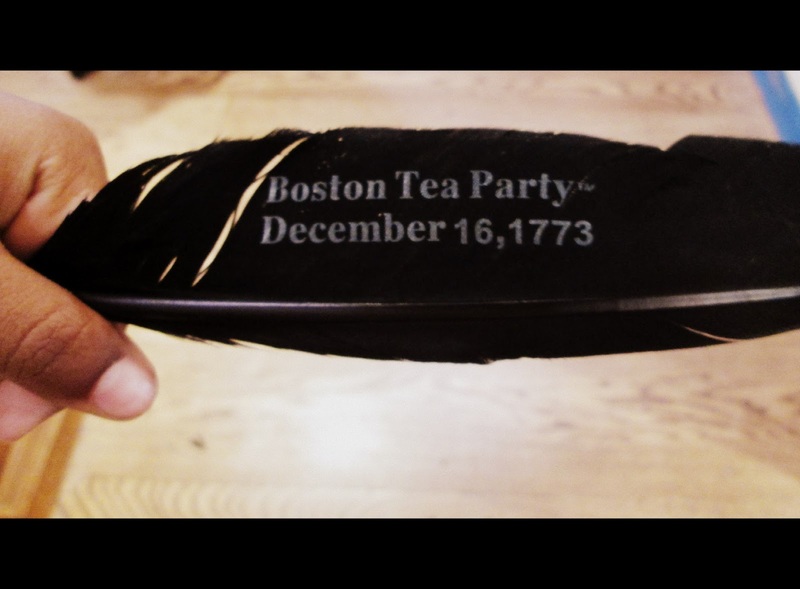 The Boston Team party organized by the Sons Liberty led by Samuel Adams is an iconic event of the American revolution. Stories about tea always fascinates us. 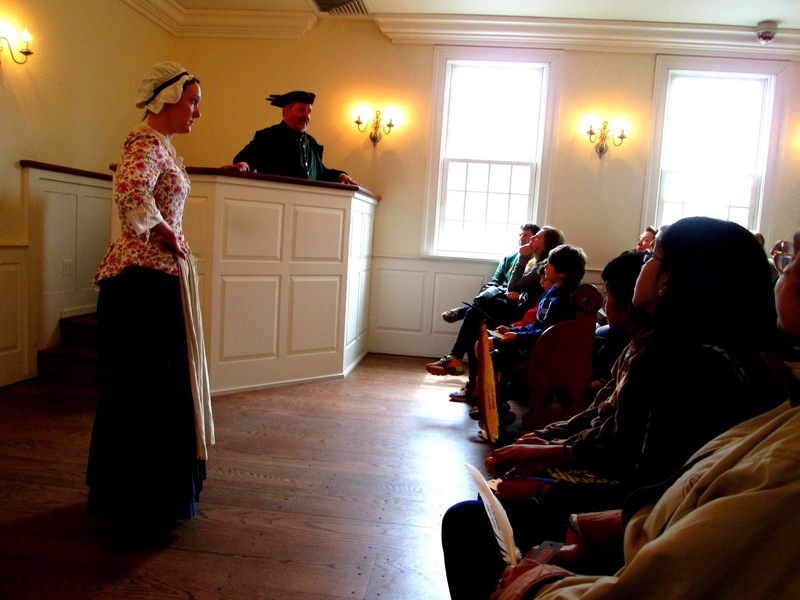 Today you can take part in the reenactment at the Boston Tea Party Museum. This is from my recent visit to the Boston Tea Party Ships and Mueseum in Boston, Massachussets. We disguised ourselves as Indians as we prepared for our big plan that night. Then, we quietly snuck onto the British ship carrying the tea, knowing that we could be imprisoned just for standing there on that boat. All of us started to fling the chests of tea into the ocean. We did not spare a single vulnerable, defenseless, poor tea leaf. I stared at the tea that was sinking to the bottom of the sea, then ran off the ship, thinking about how shocked the redcoats were going to be when they stepped on the ship tomorrow! 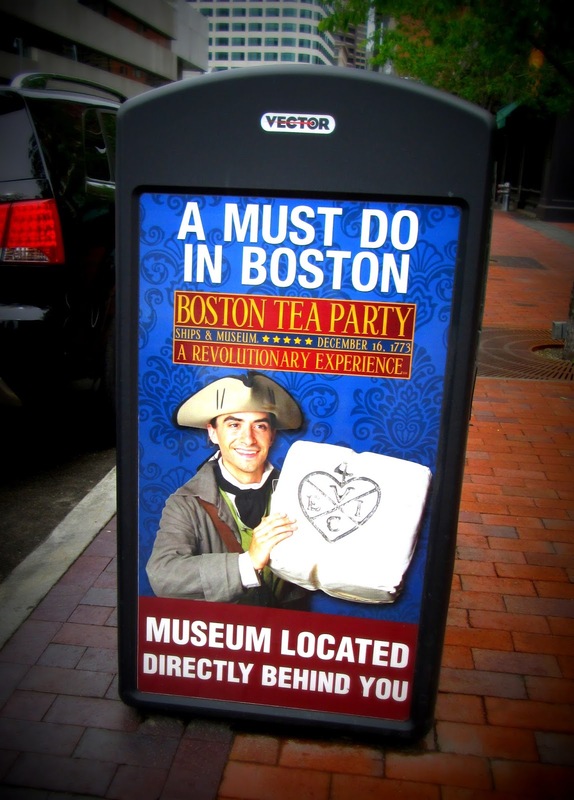 So if you are in Boston, a must do in Boston is the Tea Party Museum. 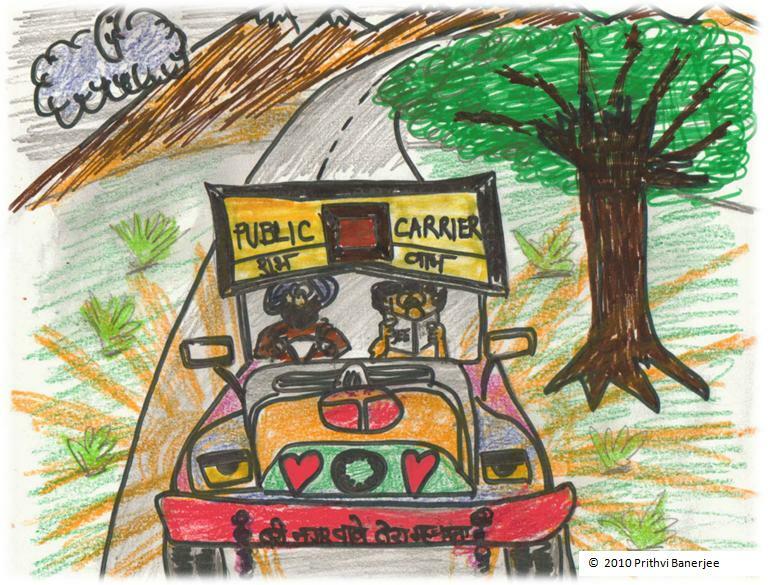 Story and Pictures by: Shish Kabob – an intrepid adventurer, a cartoonist and an aspiring young author. Speaking out and seeking help is often the most difficult first step for people who witness turbulence, violence and disrespect in personal relationships. What is even more difficult after the first step is taken, is finding support within friends and family. This is a story about a friend coming to the rescue of another friend. We were “fetus” friends, as I describe! Our mothers were friends and we were born couple of weeks apart. Hence we knew each other since we were “formed”. She was big, bold and dominating. I was petite, quiet and submissive. She was the dare devil, ready to break all rules, I was “mom-fearing” and bound by rules. There was nothing much in common yet we were connected strongly by an indefinable bond. She was a leader, full of confidence and a brilliant performer. And I was a learner, lacking confidence and afraid of performance. Yet, I was there for her whenever she would need me, quietly watching over her shoulder every move she made and appreciating every milestone she achieved. We never realized as kids what bound us close when we had hardly anything in common. But destiny had it’s own ways of testing our friendship. As we entered our teens, she was sent to a boarding school and I was left alone. I felt a part of me was snatched away and my heart kept bleeding from that blow. I eagerly waited for the first few months to go by and for her to come home for vacations and we would be together again. And then when she was back, I was curious to know all about her. “Did you miss me?” Was the first thing I asked with lot of enthusiasm. “No”, was the short reply. “I made lot of friends and I am very happy in my hostel”. My tender heart was broken for a moment but it knew how to let go. “She is very happy to be in the hostel”, I told myself. “I should be happy for her as she adjusted to her new environment. I don’t need to watch for her anymore”. As years passed by, we grew up differently and our personalities were totally different. We met during vacations but it never felt the same anymore. After high school it was my turn to go to the hostel and again distance got between us. She never liked writing letters so there was no communication as such (there was no internet back then). We both finished our graduation and were getting ready to pursue further degrees. Distance kept growing and we kept moving far from each other. And then it was time for her wedding; I couldn’t even attend as I was studying abroad. That was the final nail in the coffin and I knew that we will never be together again. It was almost time for me to give up my search when finally I found her on Facebook! My heart swelled in melodies and my eyes moistened with tears. That moment of joy didn’t last long when I found out how she was! The bold, confident dare devil whom I knew had now become timid and fearful. How did it happen? What went wrong? She can’t be in depression! My mind raced back to our childhood days when I used to silently watch over her shoulder to make sure that she was fine, it was all for a reason. Though I was timid and quiet, I was always sensitive and mature. Guarding her were my instincts and protecting her was my reaction. In an instant, I found a reason for my existence, a purpose for my life; to heal her wounds and to protect her vulnerability. I realized why I was protective about her, why I was not in peace while we were distant, why I missed her so much though she never did! Because she always resided in me. Separation was just an illusion. I felt an excruciating pain mixed with infuriating anger to find her in distress. She was taken over by an anguish of grief which totally transformed her persona. A feeling of hopelessness had plagued her mind and her real self was lost. It was my turn to put her back together and wipe away the tears. I had to show her hope. I had to give her the courage to fight back and find her path to happiness. Despite the physical distance, she could feel my presence around her and my healing touch. She started to believe in future. She started to breathe, and once again, she started to live! It was a new beginning, a new day with a new vision of a bright future where the past was just a bad dream. Just the feeling of togetherness was so fulfilling that she could welcome every day with renewed vigor, joy and cheer. It was still the same bond, the “fetal bond” with which we were born which was much stronger than the distance or the decades. Because certain relationships never change and are meant to be the way they are! Foreword by Piya Mukherjee: Dr.Daya Kishore Hazra, the author of today’s post is a renowned doctor in India and has been practicing medicine for many decades now. He was conferred a national award by the Government of India for his contributions towards the field of medicine. It is my absolute privilege to know him personally and introduce him to our readers today. I had the opportunity of hosting him at my home over Father’s day weekend last year. At an age that many have already retired, I observed him working from the crack of the dawn till late in the night, traveling long distances to give lectures and attend seminars, and taking the numerous calls people make to seek his advise on medical issues. The people calling him were patients, friends, family, his students, neighbors, friends of friends, friends of his children and the list is endless. I observed he does not refuse a single call and listens to each one patiently and then advises the next step or refers to a doctor he knows. He does not refuse anyone. He gets nothing tangible in return. But what he does get from everyone is their love and respect for the caring and immensely thoughtful person he is. For the few hours a day that he does not work, he is a doting father and grandfather and loves to be surrounded by family. His energy level is enviable. For a profession that has been in much criticism for its commercial inclination in recent times, Dr. Hazra’s dedication to help and care for everyone should be an inspiration to all in the medical profession around the world. Where does Dr. Hazra draw his inspiration from ? 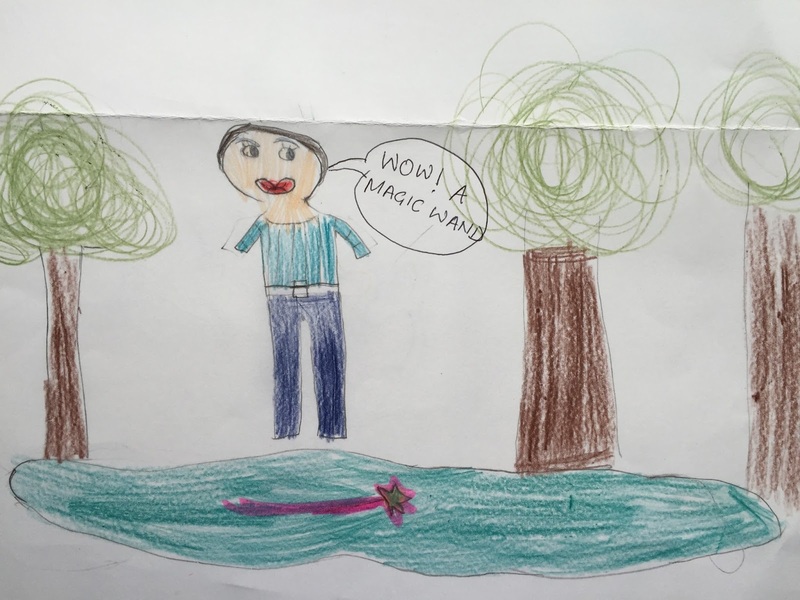 The answer lies in this Father’s Day post he wrote for our blog. Fathers are heroes for all, and in my case, His impress was such as to be an ideal to strive to follow in some small measure. An excellent physician of national and international repute, it is still a thrill to receive every so often letters addressed to him seeking medical advice, into even 49 years after his passing away. After obtaining his MD in conventional modern medicine from Boston (Cambridge, Massachusetts) in 1930, he went on to be converted completely to Homeopathy. He had students throughout India, and in 1948 after Indian Independence he was appointed Vice Chairman of the Homeopathic Enquiry Committee chaired by Rajkumari Amrit Kaur, the Health Minister, which made recommendations regarding the development of homeopathic education in this country. One remembers his sitting far into the night analysing a case until he was satisfied that he had arrived at the correct prescription. My mother would remind him about the dinner getting cold, but he was meticulous and relentless in his concentration until this was achieved. Once decided he had such confidence in his prescription, he would often predict the date when the patient would be controlled. Such painstaking analysis meant that he would see only 2-4 new cases every day, and his calendar would be booked months in advance. Apart from this role as a physician, he was also a devout follower of his Guru, and eventually followed him as leader of the Radhasoami Faith community centred in Soamibagh, Agra. Elaborating on this aspect of His life must await another occasion. As a father he was affectionate, and taught me habits of study: making ‘skeletons’ of every subject topic of study ,finishing syllabi in the summer vacation ahead of the class, but avoiding last moment stress, even advocating seeing movies and light reading in examination times. He introduced me to Swami Vivekananda’s English exposition of ‘Raja Yoga’, Sivananda’s Yogic Home Exercises, apart from the texts of the Radhasoami Faith. He termed condemnation before investigation as the enemy of the scientific attitude and taught me to be fearless. He wrote in my autograph book to remember that the Final Court of Appeal was prayer to the Supreme Father Himself. Fathers Day is an occasion to remember! I still pray that I may emulate him in even a small measure, and that His blessings abide with me! I’ve been wanting to write about different Dads I’ve met in the last couple of years. 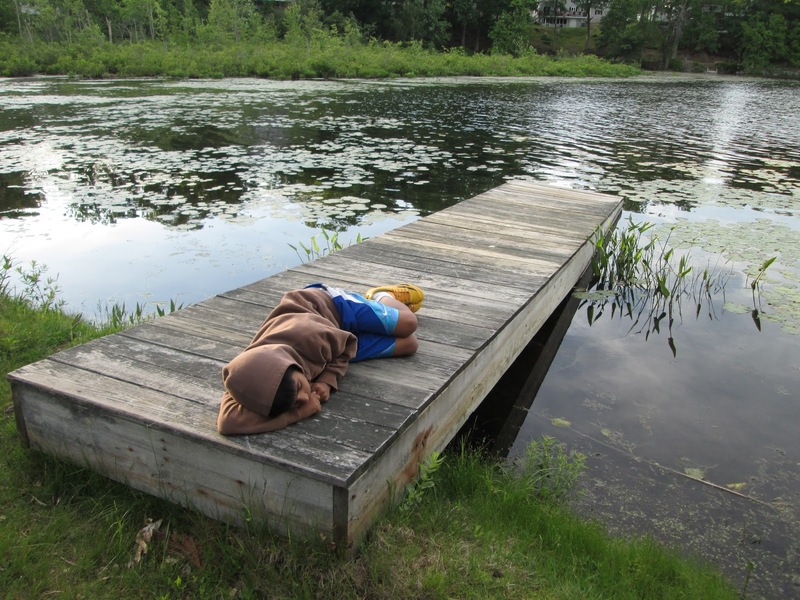 Since I became a dad to a wonderful child, I’ve been noticing other new dads more closely. As a wedding photographer I keep meeting a lot of dads from the previous generation too. So that’s close to 50+ dads in total. What I’ve noticed is that 3 in 5 dads from the previous generation, that is dads of adults around my age, acted like their task was done the day they had a child and after that it was all up to the mother to take care of the child. Even during the wedding they seemed slightly detached from their son/daughter. I thought probably now that their children are grown up they feel that way. But then on the other hand, 2 in 5 fathers were crazy about their children who were getting married, they would get visibly emotional at every stage of the wedding ceremony. Not specific to daughters but to sons as well. I noticed that they had a great bond, a best-friend kind of bond. It was so inspiring. I want to have a relationship like that with my son. With our generation of fathers, what I’ve noticed is that 4 in 5 dads are crazy about their children. I feel bad for that 1 dad. He has no idea what he is missing. I overheard one dad saying that until the kid is a particular age, he doesn’t know what to play with the kid. This is not a one of case, but I’ve met many dads who behave like this. The good news is that 4 in 5 dads are just awesome dads and are going to be awesome dads for sure. I was thinking, what motivates me to be with my son all the time. Well. I’m crazy about my son. I want to give him as much exposure as possible. I want to distribute the responsibility of bringing up the child equally with my wife. Yup. Those are the main reasons, there might be others, yet to figure them out. I’m just wondering if there is a way to spread the awareness of how important a dad is in a child’s life. I want to thank CloudNine hospitals for stressing on a dad’s role in a child’s life. I’m sure at least some of them took it seriously. Hope this blog helps somebody. 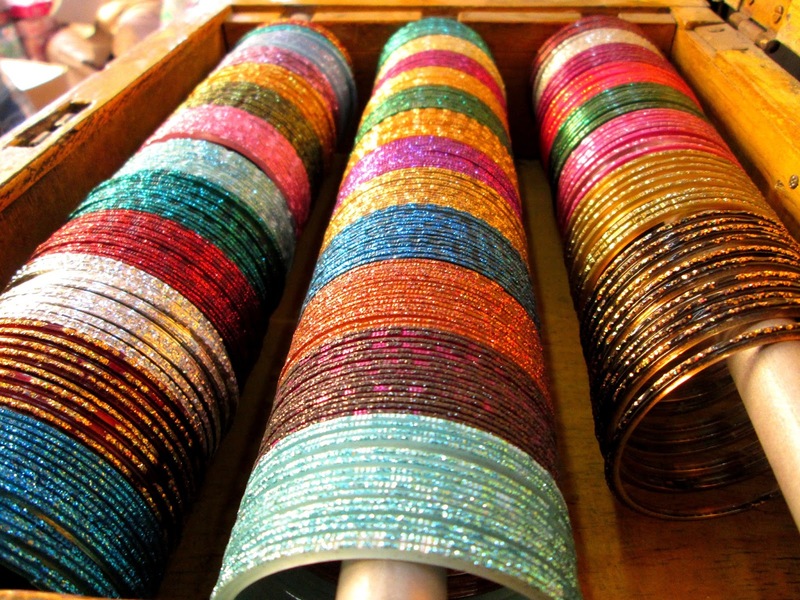 This story has been contributed by Phalgun Polepalli. Phalgun is the Founder and Creative Director for CuspConcepts. His stories are through his lens. His pictures make everyone go weak in their knees and want to take a plunge, make a walk down the aisle. He is also a doting father and has been actively blogging (quite secretly) about his views on parenting. Over a month ago, I called a friend of mine to say Hello. I do that once in a while with most of my friends. That once in a while is sometimes after a few days, mostly few weeks and many a times even after a good few months. So there is usually a lot to catch up on. We sat and talked for at least half hour about how busy our lives had gotten. And then my friend said something that stuck to me real hard and I have been pondering over it since. That accidental statement is the reality of our lives today. I can say this just by evaluating mine over the last several weeks. It begins at the crack of the dawn. In the rush to get out of the door, avoid tardy slips and getting late for the morning stand-up meetings, we skip breakfast, we forget to give hugs, we yell at each other over missing homework folders and misplaced car keys. Our excuse – we are busy. Our minds are occupied. There are tons of new emails sitting in the Inbox, there are reminders of conference calls popping on our phones, the endless beep of text and Skype messages from colleagues that need to be answered promptly. More tools, more communication, busier we are. The pattern continues through out the day. More work, more commitments, more deadlines and more of the “busyness”. I also noticed that everyone at work spends a few minutes of any conversation exchanging notes about their “busy” schedules. Now add to that mix a bad commute, logistics of running a home, making rounds for errands, volunteering at the kid’s school, chauffeuring the kids to the various classes. If that is not busy than what is? So once all of that is taken care of, “busy” should be all done with for the day. Or so I thought. A quick fix for dinner, a rushed dinnertime, hastened reading time all in prep for another day to be busy with. Busy was my or I should say ours (my husband is an equal partner in this) standard excuse for anything and everything ranging from pending bills, half done home projects, missed doctor appointments to unkept closets, clutter in our cars and mounting stack of unread mails. It was fine till that extent. But then “busy” started interfering with our Netflix binge watching time, Friday family movie time, taking time to unwind time and taking time to do “nothing” time. It also became my standard excuse for not writing anything, a task that comes naturally to me and is my favorite thing to do. I have been absent on the blog for long and this should explain why. I was busy. This had to change. But “how” was still an open question? One thing I did figure out was that I had to wipe off “busy” from my mind, albeit even for a small fraction of time each day. So in the evenings, we started doing things differently. Dinner is still a quick-fix yet something not just done in a haste for the sake of it. Reading is done more leisurely followed by giggles and animated conversations. We lounge in the bed giving a little lax to bed time. We make time for a walk or a play in the park. I still get the household chores done, read a few pages, write a few lines and play catch up on work after all that. The important bit I realized was to not let “busy” try and overpower the mind at anytime. It takes some effort at first and then as you kick it away so far enough that “busy” sits in a corner in awe of how much you can accomplish. In my effort to do that, I have realized there was so much more in life that I was missing on. There are still umpteen mails piled on the kitchen counter staring right at my face, the house isn’t clutter free and the to-do list keeps growing but I am getting to all of it gradually. I thought I was doing well till yesterday when my mom called. This was a reminder that I had probably started verbalizing my state of mind too. I finished her work in record 10 minutes after our call. That’s exactly how long it took. Most of the other procrastinated tasks including calls to family and friends are usually not more than a few minutes task. Work commitments, chores, errands and life in general does not consume us as much we think it does. I am beginning to love this “not busy” phase of life where there is much more packed in than before and there are far more smiles and laughter. My friend who preached is practicing herself. We exchanged notes recently and this time when we asked each other how we were doing, neither one of us said, “I am busy”. That is some good progress we think. We are still trying though. So how have you been lately? Busy? Everyone of us has dreamt of packing up our bags and traveling around the world at some point in life. But not many of us ended up doing so. Life consumes the better part of that dream. But not for our today’s author. She is young, enthusiastic and vivacious. She loves to travel and has been globe trotting and backpacking quite a bit in the past few years. Her enthusiasm for travel and curiosity to learn more about the different cultures, places and people in the world makes anyone determined to firm up a travel plan. This is one of her many travels, her favorite of the itineraries. 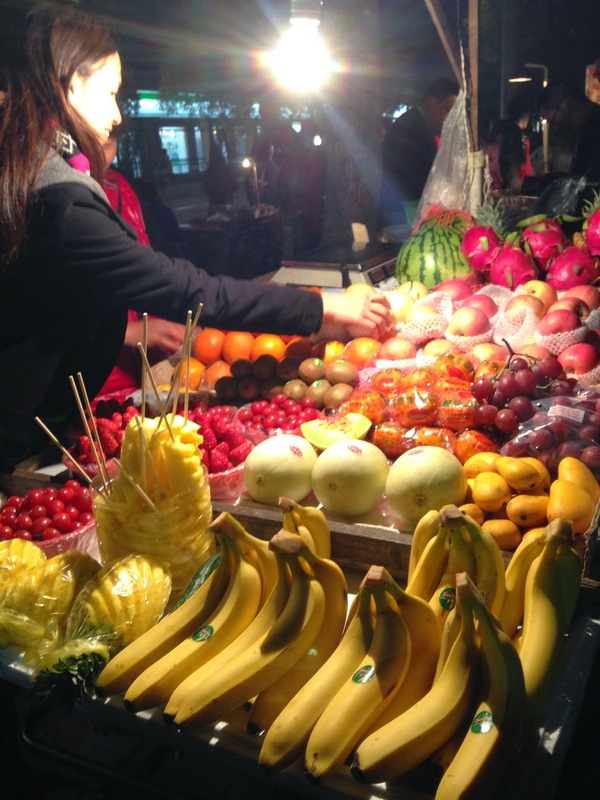 When I landed in Pudong airport in Shanghai, I had no idea what to expect from China. Would it be similar to India? A huge socioeconomic difference between the rich and the poor, with 5 star hotels and homeless alike…Or would it be more like Israel? Developed to a large extent and exploding with growth, yet paralleled with a strong sense of culture? 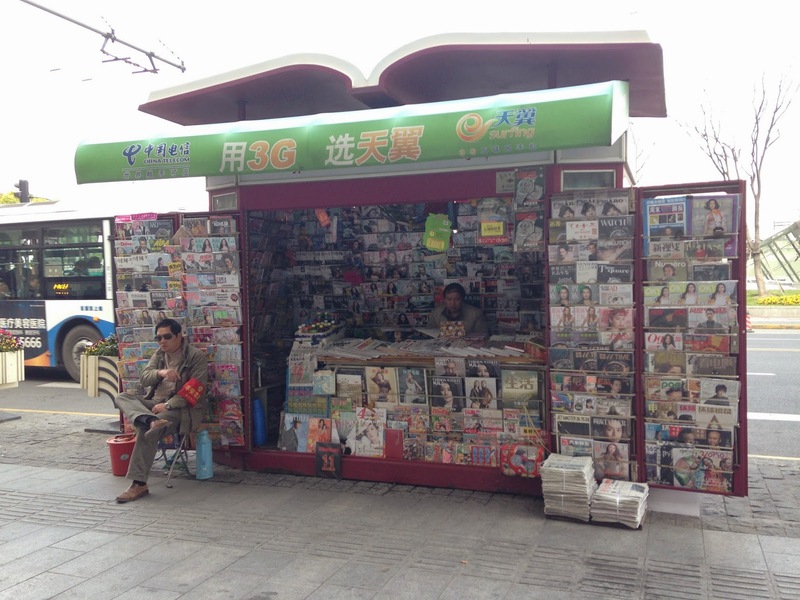 China was nothing like I had imagined. Of course, it encompassed elements of other countries and was partly like India, partly like Israel, and partly like so many other places. Yet, it was uniquely unpredictable too. 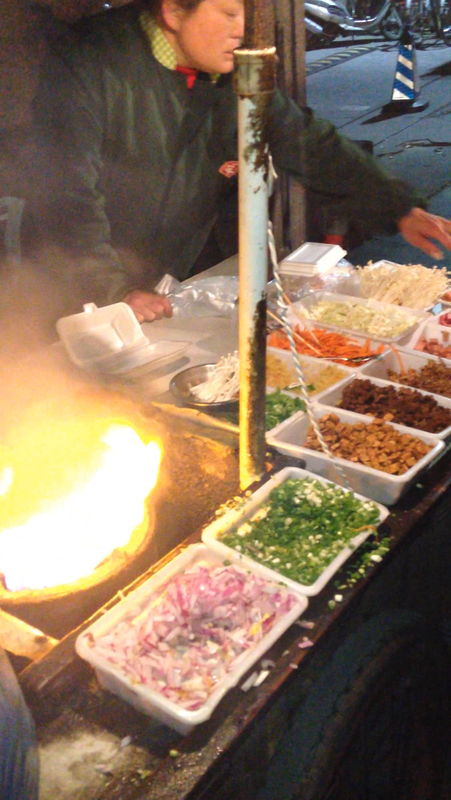 I wasn’t expecting European architecture and high-end rooftop bars coupled with rows of food carts and street vendors. Shanghai and Xian were far more infrastructurally developed than anything I had seen in India, while the cultural grounding and abundant cheap labor surpassed the Zurichs and Londons of the world. I deeply cherish every one of my experiences in China, no matter how crazy (coming up: getting food poisoning while watching my favorite DJ at a nightclub, missing my flight to Xian and getting stranded for a whole day, trying to find vegetarian food at the top of a mountain, nearly dying trying to scale said mountain, getting lost in the subway without knowing a word of Mandarin, and so much more) – so I hope that you enjoy the posts ahead! Wait till you see the next picture. There are veggie options too. 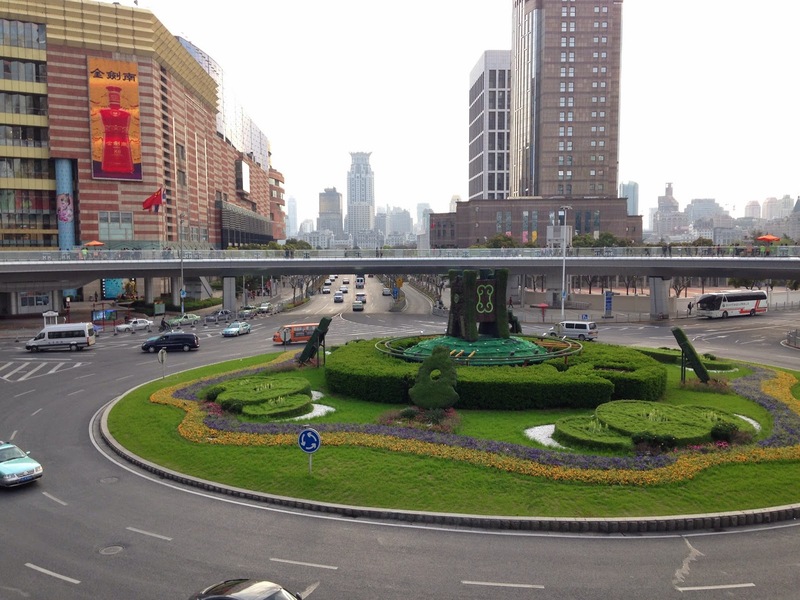 The Bund: a cultural cross-section of Shanghai running along the Huangpu River. 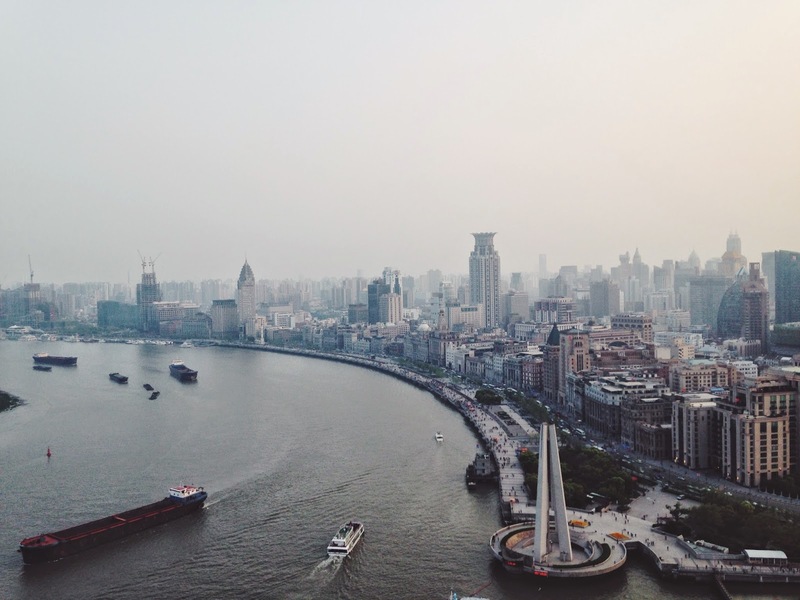 Originally developed by European settlements, the Bund was an international hodgepodge of banks, consulates, and government buildings. 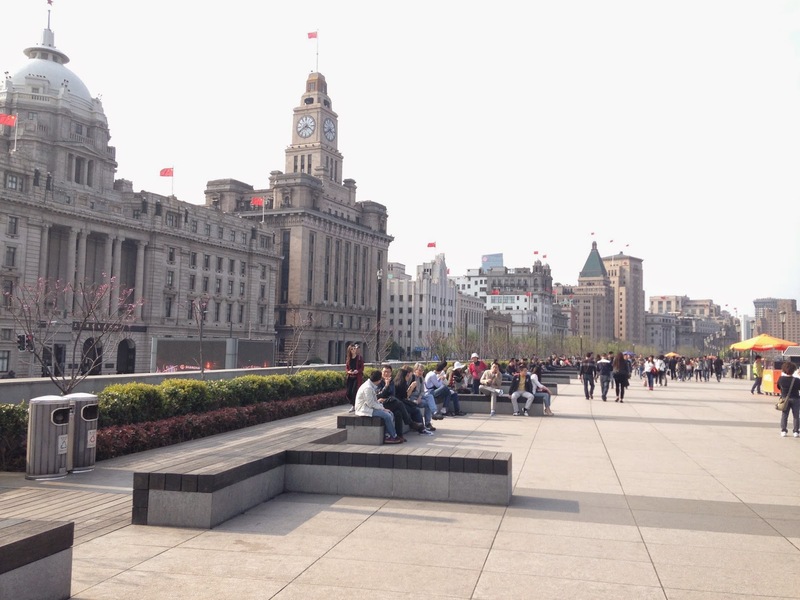 Today, the Bund houses the major financial institutions of the world and serves as a global business hub. 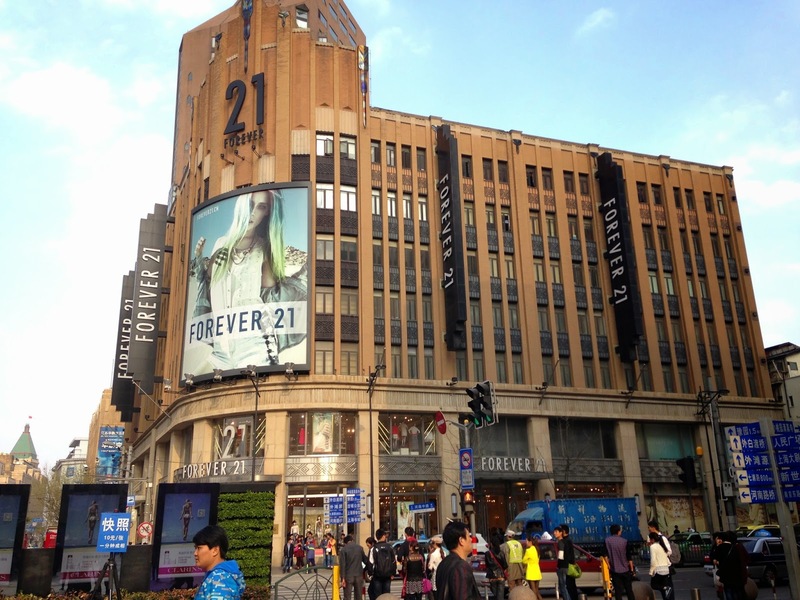 It’s architectural diversity is uniquely alluring, making it one of Shanghai’s most popular tourist destinations. Reminds you of square in any European city ? This last shot is from the rooftop VUE bar, overlooking the Bund on a gloomy Shanghai day. 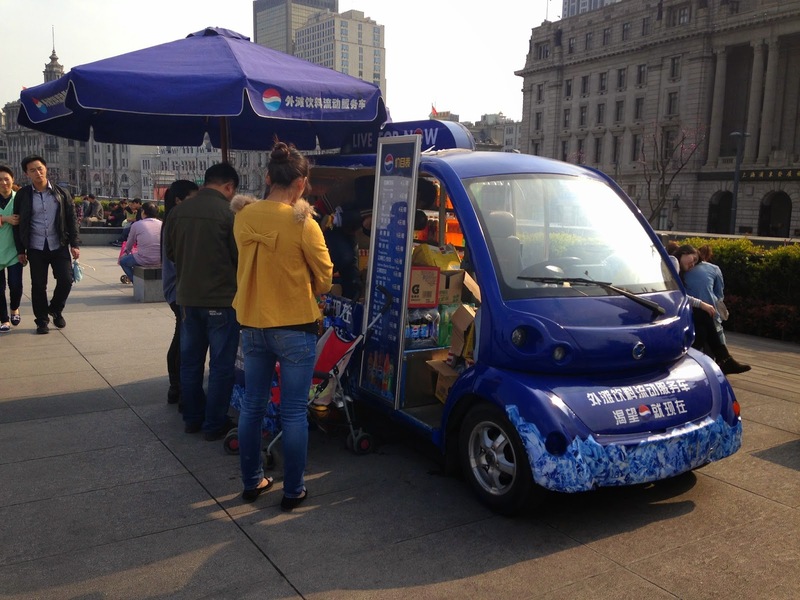 The Shanghai public infrastructure explosion is world-famous. 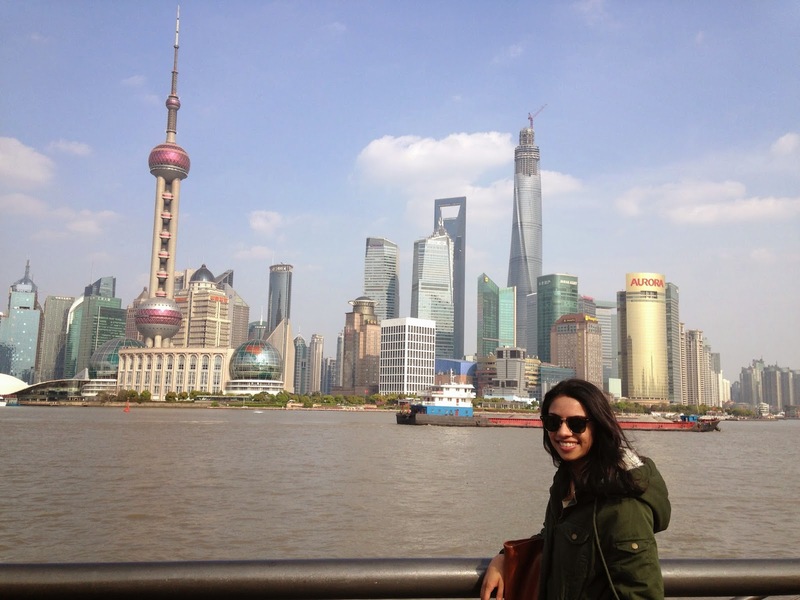 Lujiazui, Shanghai’s Financial District, is a testament to Chinese growth and development. 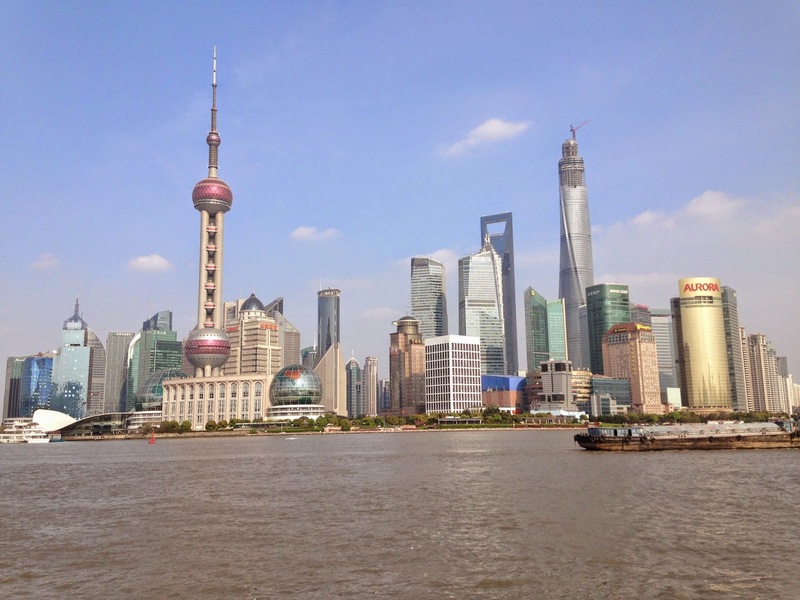 The landmark buildings that exemplify the Shanghai skyline include the Shanghai Tower, the Jin Mao Building, the Oriental Pearl Tower, and the Shanghai World Financial Center. We took a high-speed elevator to the top of the skyscrapers for a beautiful view of the business district. 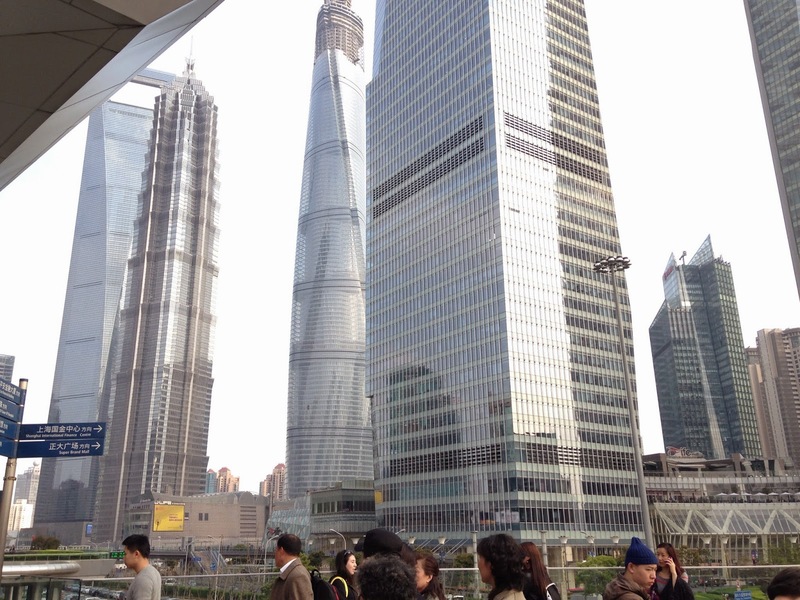 The Shanghai Tower is the tallest building in China and the second tallest in the World, after the Burj Khalifa in Dubai. 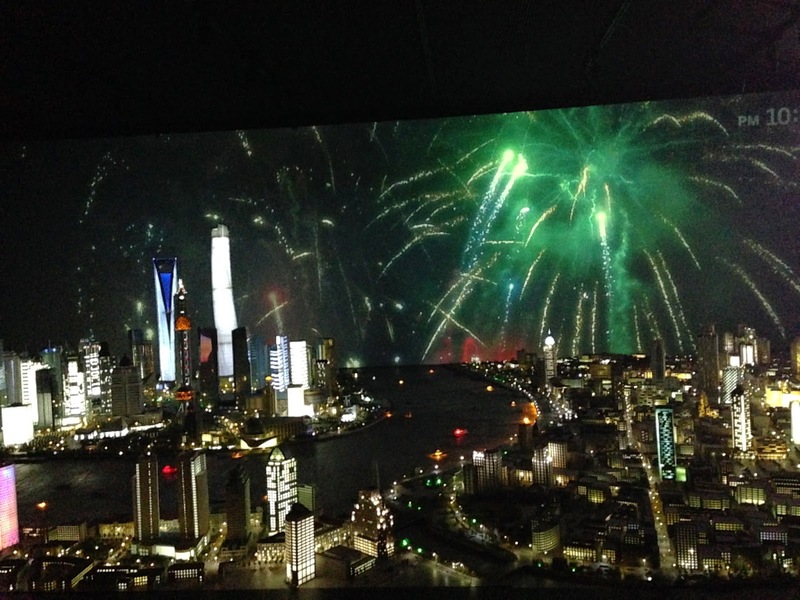 The high-speed elevator is modeled similarly after the one in Dubai, a strategic tool that has fueled tourism and business-related travel in Shanghai. We hope you all enjoyed this post. 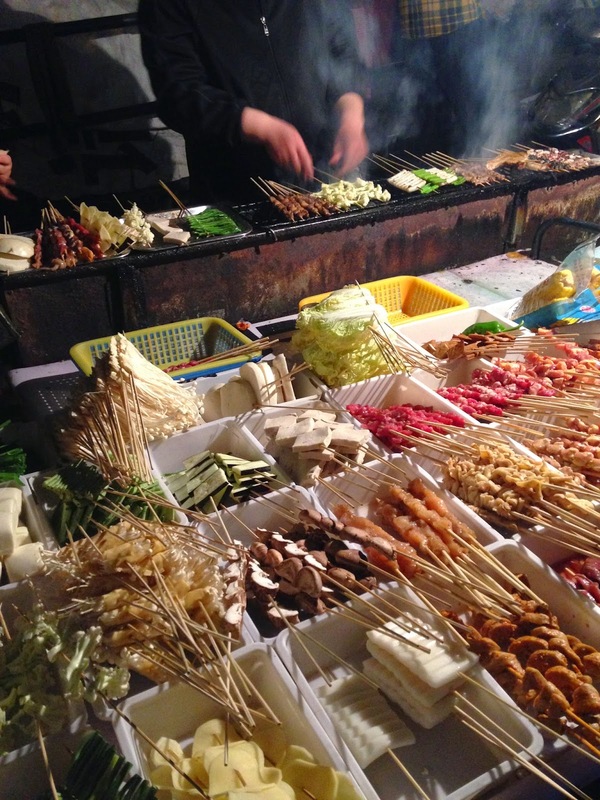 This is Part -1 of the author’s travelogue to Shanghai. 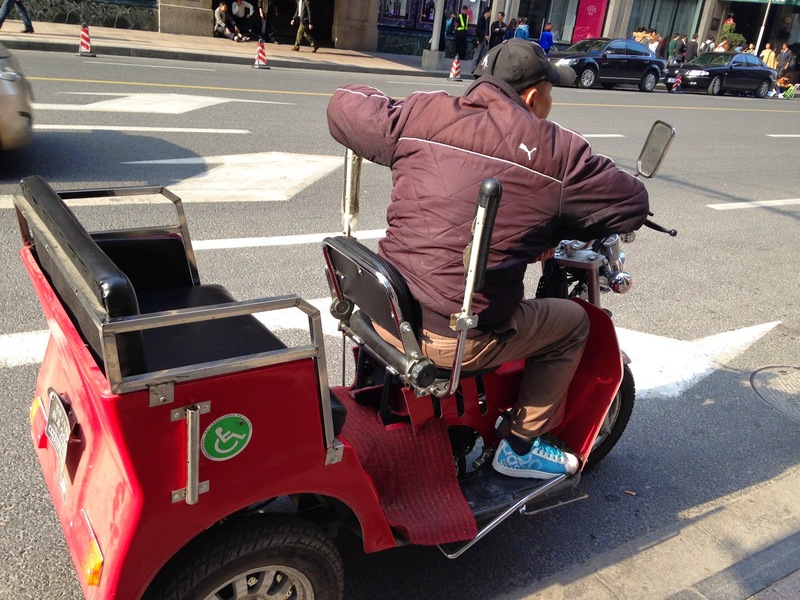 This shows the modern and contemporary Shanghai. More to come on the traditional part of Shanghai! Our storyteller for today, Siddharth, wrote “SuperDaddy” for this blog recently and it was loved by one and all. Just like the first time, he keeps things simple. The good guy must always win over the bad guy. That is the universal law. If you are good, you will always find a way to do that. Once upon a time, there was a poor villager. He worked for a very mean landlord. Everyday the landlord commanded the poor villager to do stuff for him. One day, the villager said to himself, “I’ve had enough of this.” So he set on a journey to find mysterious magic in the forest of Magic. Before he left, he gathered all the stuff he needed. Then he went inside the forest. It was a long journey. It took many many weeks and he met many, many animals. He made many friends along the journey. One day, the villager came across a lake. He bent down to drink some water out of it. Then surprisingly, a magic wand bobbed up to the surface of the lake. The villager carefully took the wand out of the lake. He knew what the wand could do. In the right hands, the wand could do anything. So he went back to his village and got the mean landlord arrested. Then, he got awarded a thousand bucks. Now he wasn’t poor anymore and everyone lived happily ever after.